Sony Xperia Z review | What Hi-Fi? Is the Sony Xperia Z the flagship smartphone we've all been waiting for? It's fair to say the Japanese giant has lagged behind the pack in the mobile world for a while now. The likes of Samsung, HTC – and, with the Nexus 4, LG – have all outpaced and outclassed Sony with flagship phone after flagship phone. We’re sure it hasn’t been fun for the company – but instead of bowing out, Sony’s taken its time and is now upping the smartphone ante in style with the Sony Xperia Z. Yes the Xperia S and Xperia T played catch-up very respectably in 2012 (with the latter even winning the right to cosy up to James Bond’s giant lugholes). But this is the first time Sony has fired the starting shot, unveiling the Xperia Z: its 5in, 1080p, quad-core, 4G-ready smartphone (which is also waterproof) at the CES show in Las Vegas in January. If specs like that get you all hot under the collar, by the way, you’re in luck. The Xperia Z is the first 1080p handset we’ve reviewed – but the 4.7in HTC M7 is on its way and we’re expecting a 5in Samsung Galaxy S4 by the summer, too. First up, a 5in screen might seem excessive but you’ll soon rely on that extra real estate for watching films, editing images and scrolling through the web. The size does make the Xperia Z tricky to hold one-handed for some folk, though, so it’s worth trying out the handset before you buy one. That Full HD screen is a beauty, however, and the jump in quality is plain to see when it's displaying text or hi-res images. Fonts on web pages and ebooks are rendered beautifully and at 443ppi (pixels per inch), the Xperia Z’s display puts plenty of breathing room between itself and rivals like the 326ppi iPhone 5. Aside from endowing the Xperia Z's screen with that astronomical pixel count, Sony has worked hard to further improve the quality by borrowing tech from its Bravia TV division. The phone's Mobile Bravia Engine 2 is designed to improve contrast and sharpness of videos. In use it's prone to giving pictures and home-made movies a slightly oversaturated look, but there is a slight improvement in contrast – so it’s there if you want it. Get some HD content going from Google Play and the Z’s screen offers up smooth motion and bags of detail. Of course, the 5in screen gives you more picture to gawp at too, and it’s one of the best we’ve yet seen on an Android phone. Sony has opted for a cool colour palette majoring in fine detail – something rival handests struggle to deliver. Viewing angles are still a problem, however, which means that when it comes to sharing the screen with a friend, the TFT display can appear too washed out to be watchable; it’s especially sensitive to being tilted up and down, with even slight movements affecting image quality. Head on, though, it’s a stunner. 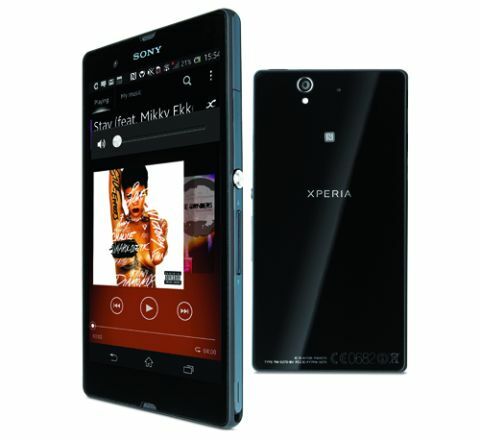 When playing Rihanna’s Stay or streaming an episode of House of Cards, the Xperia Z doesn’t shine with the supplied headphones. To be fair, they’re better than other pre-packaged buds we’ve come across – they fit reasonably well and sound relatively weighty and solid – but they do sound a little boring. You'd be far better off using a decent pair of on- or in-ears such as the Award-winning AKG K451, Philips M1 or SoundMagic E10s. Get that match right and you'll get plenty of detail to soak up, and solid, agile bass to admire. There’s a hint of brightness, but nothing we’d consider distracting (which does make the phone's ClearAudio+ feature, which boosts midrange and treble to inject more excitement into the sound, seem rather redundant). This is one of the best-looking handsets we’ve seen, with Sony’s new OmniBalance design getting all the small details spot on – from the big aluminium power button placed mid-way up the right hand edge to the symmetrical microphone and speaker arrangement on the front. The chassis itself is made from shatterproof tempered glass, which gives the Xperia Z a subtly stylish look compared with the Samsung Galaxy S3. Aside from the fact that a cleaning cloth should be kept close to hand (the ridges down each edge are real dust magnets), it’s an impressively solid build and all the ports and SIM card slot are tucked away under neat flaps so as not to ruin those lines. Among those ports, incidentally, is a microSD expansion slot for cards up to 32GB, which is good news as Sony is selling the Xperia Z as a 16GB device. Another reason for Sony keeping everything – including the headphone jack – covered up is that the Xperia Z is waterproof with wet-finger tracking, so it remains usable when soggy. It can spend up to half an hour submerged in water, is IP55 and IP57 certified and can also handle jets of water – so not even a spilt pint or the occasional downpour can faze it. Don't be too quick to listen to your phone in the shower with a pair of waterproof headphones, though: having the flap for the headphone socket out and exposed all the time seems like a recipe for disaster. If it ever snaps off then you’re not only left with a non-waterproof phone, the clean lines of the design are also ruined. With Android Jelly Bean 4.1 onboard, the Xperia Z is lags ever so slightly behind the Google Nexus 4, which runs version 4.2 – but Sony says its phone will get the update in March. Anyway, it isn't too much of an issue, because navigation around homescreens, apps and menus is very swift indeed. That's partly down to Sony cleaning up its unnecessary widgets: for example, its social media hub Socialife has been hidden away in the app drawer and Timescape has been ditched altogether. You do, however, get Google Now, the automatic personal assistant which can come in handy for checking transport times quickly, as well as Wisepilot for turn-by-turn navigation and a spruced up lockscreen that gives quick access to the camera and music player. Overall, Sony seems to have finally got the balance right between tweaking Android and making it easy to dive into its entertainment portals. Day-to-day use is as snappy and lag-free as we’ve come to expect from the Nexus 4 and Galaxy S3, and for processing power it’s up there with the pumped up Galaxy Note 2 thanks to the quad-core Qualcomm chip running the show. The phone also has near-field communication (NFC) abilities. This tech standard lets two compatible phones or devices send and receive data by touching or coming within a few centimetres of each other. The Xperia Z can handle all the usual NFC tricks: from pairing to specific headphones or speakers to paying for your Starbucks coffee and altering your phone’s settings by touching Smart Tags. With the Z, Sony has also introduced one-touch sharing of photos, videos and music by tapping the handset to the remote of some of its new Bravia TVs, such as the W900A series. If the brightness control is left on automatic, the Xperia Z should last the day without recharging – helped out in part by switching on the clever Stamina mode. This turns off all data when the screen is off – which means waking up in the morning to the same battery percentage as you saw at lights-out… magic. Otherwise, the Z’s beefy 2370mAh battery drains just as quickly as any other big-screened flagship, which could be a letdown. As with most recent releases, the Xperia Z is 4G ready, which means you can take your pick between standard contract prices or shack up with EE for data speeds up to five times faster than 3G. You might find that the battery takes a hit when there's a 4G SIM involved, but it comes down to a choice between a phone that lasts the day and faster streaming and download speeds. With intuitive controls borrowed from Sony’s Cyber-shot cameras, the Xperia Z matches the best of 2012’s smartphone snappers rather than improving on them. The 13.1-megapixel camera takes fine shots outdoors and in good light, but even though the Superior Auto mode is very quick to adjust, it could be better at getting rid of noise in low light. Full HD 1080p video shot with the rear camera is clear and smooth, though, and there’s a high dynamic range option for stills and video. Leaner and meaner than previous Sony handsets, it’s in its practical aspects that the Xperia Z really shines: a 16GB device with expandable storage to make room for all those HD downloads, a waterproof chassis and a battery Stamina mode that means your smartphone’s standby is your new faithful friend. But the stand-out spec, of course, is that 1080p screen. There’s much to love about the display, and if it’s an eye-popping picture you want, the Xperia Z rivals the Galaxy S3. A true stunner.